We are finally beginning to delve into the world of cloud computing. The cloud that is being built on campus is almost complete and the team working on the installation is doing a great job and putting forth a lot of their personal time to finish setting it up. In the meantime we have been given research assignments to coincide with the Eucalyptus installation to learn more about the project itself. I personally have been researching the bug tracking system that they are using. Currently you can access the bug tracker right from the http://open.eucalyptus.com/ page located under the participate menu item. From here we are given links to different areas in the Eucalyptus project. You can go straight to the issue tracker and view the current support issues they are experiencing. 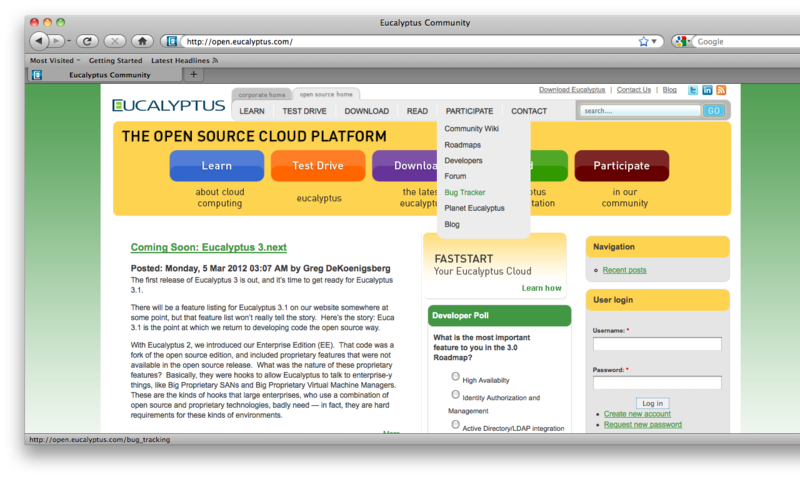 There is also a link to the launchpad which hosts all of the open source code for Eucalyptus. The launchpad also has a link on the top to view current bugs and lists them by their priority. I have only just begun researching this portion of the project and the rest of the class is also researching other components. We are doing this to familiarize ourself with the many various aspects of the project and it is helping us learn everything involved in a shorter amount of time. Hopefully by the time we have our next class the cluster will be up and running and we can really begin to learn how the project works and maybe even contribute to it.